It was so very nice of Progressive Conservative leader Tim Hudak to drop by Cobourg Wednesday to support local candidate Rob Milligan with a photo op at Horizons Plastics. 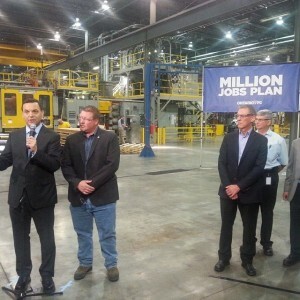 To see Hudak and Milligan standing on the shop floor with the Million Jobs sign behind them was visually pleasing. And, the choice of backdrops could not have been more telling. Horizons Plastics faced a strike last November as the company wanted to gut employees’ job security and benefits to the tune of about $1,000 per person. Even more ironic is the longtime Cobourg company, which produces custom plastic parts, set up a satellite plant in a Mexican tax-free zone in March 2013. President Peter Garvey said the new plant offered the chance to go after new sales opportunities. Garvey said the idea was to grow both plants at the same time. However, employees were very concerned, saying the Mexican plant meant the company could shut its Cobourg operation down at any time. Garvey complained his American competitors were only paying $13 to $15 an hour, compared to the higher wages being offered in Cobourg. Finally, in January 2014, the company locked out its unionized workers. After three weeks of negotiation, a deal was reached. A four-year contract was signed with restrictions on temporary agency workers, unionized flexible work employees and restricted when those employees can be used. The employees got lump sums in the first three years and a 1.5 per cent increase in the fourth year. So this is the kind of businesses Hudak wants for Ontarians – places where the company can pack up at any minute and take its operation to another country, leaving local, rural residents without jobs. Funny, this doesn’t sound like a job creation plan at all. It also appears to be a place that welcomes Hudak’s plan to bring more foreign workers to Ontario so they can glut the labour market and drive down wages, just like they were trying to do at Horizons Plastics. It is no wonder Garvey did not want to answer media questions; it could have been another fiasco on the campaign trail for Hudak, similar to the Metalworks photo op a few weeks ago. Yup, those Hudak campaign organizers sure know how to pick ‘em.